As a pet owner, do you find yourself relating to any of these common situations? Are you (or someone in your household) allergic to cats or dogs and desperately seeking relief from pet dander? Is pet hair shedding all over your floors and furniture and you wish it would stop? Do you have problems with pet odors and smells, and want an easy way to get rid of them? If you answered yes to any of those questions, then you’ve definitely landed on the right page. In this article, we’ll not only share with you what the best method is for getting rid of pet dander, hair, and odors, but we’ll also show you what the best air purifier for pets is and why it works so well. As proud owners of our own pets, we know exactly how much you love your animals. After reading this short guide, you’ll have everything you need to create a cleaner, fresher living environment that both you and the furry members of your family can enjoy! Before we jump into what the top air purifiers are for pets, you’ll benefit greatly by first discovering what the differences are between pet dander and hair, and how each one impacts your health. This little bit of knowledge will pay off in the long run because it will help you choose the best air purifier for your specific needs (and save money) as a pet owner. According to the 2015-16 APPA National Pet Owners Survey, 79.7 million U.S. households (or 65%) own a pet. That’s up from 56% in 1988 when the last survey was conducted. The American College of Allergy, Asthma & Immunology concluded that approximately 50 million people in the U.S. have nasal allergies. This includes 30% of adults and 40% of children. WebMD states that 1 in 5 people in the U.S. has either allergy or asthma related symptoms. As you can see, the number of pet owners and those who suffer from allergies or asthma is increasing at a steady rate. With statistics like these, it’s no wonder why so many of us are dealing with a runny nose, congestion, sneezing, difficulty breathing, and itchy, watery eyes on a daily basis because of our pets. But, do you know what actually causes these pet allergy symptoms? If you’re like most people, you probably think that issues related to cat and dog allergies flare up from breathing in pet hair or getting it in your eyes. Unfortunately, that’s just not true. What really causes pet allergies is the microscopic dander that your pets shed, not their hair. Pet dander consists of tiny flecks of skin that peel off with your pet’s hair, fur or feathers and it comes from all types of pets too, not just cats and dogs. Animals such as ferrets, hamsters, guinea pigs and even birds produce dander that causes allergic reactions in humans. Contrary to what most people think, dander actually gets worse as your pet gets older and sheds a whole lot more, not less. That’s why people with animal allergies notice an increase in their symptoms as their pets’ age. Pet hair, on the other hand, is exactly what the name implies – hair or fur. There are no known allergies associated with coming into contact with animal hair. The only issue with pet fur is that it tends to collect in clumps on the floor and makes a mess on your furniture. Fortunately, both of these issues can be fixed with an inexpensive air purifier. Using an air purifier in the home is one of the best things you can do as a pet owner. Air purifiers are the only household devices that can pull dander, hair and odors out of the air, essentially cleaning it and making it as fresh as possible. Now that you know the difference between how pet dander and hair impact your health, you’ll be ahead of the curve when it comes time to compare the best air purifiers for pets for your own home. With that said, here are the essential features to look for to get the best deal and right product for your needs. If you or someone in your household is allergic to any type of pet, including dogs, cats, birds, etc., you’ll want to make sure you’re getting the best air purifier for pet dander. The top product for removing dander will have a “True HEPA filter”. The reason you want an air purifier with a True HEPA filter is that it’s the only one certified to remove 99.97% of allergens as small as .3 microns. This includes all types of pet dander, from every kind of animal. Some people wonder if there’s a single best air purifier for cat allergies or dog allergies alone, but the truth is that this filter covers them all. Air purifiers with this feature work by sucking dander particles out of the air and trapping them in the True HEPA filter. Once these allergens are collected, they can’t be re-released back into the air for you to breathe, touch or get in your eyes. The more you run an air purifier like this in your home, the less animal dander there will be to irritate your allergies. Running it 24/7 offers the most relief. Take a look below for our top recommended air purifier with this feature. If you don’t have pet allergies and just want to get rid of dog hair or cat hair that’s filling up your home, then you can save yourself a lot of money by going with a cheaper option. Since you don’t need an air purifier to get rid of microscopic dander, you don’t have to pay a higher price for a device that has an advanced True HEPA filter. 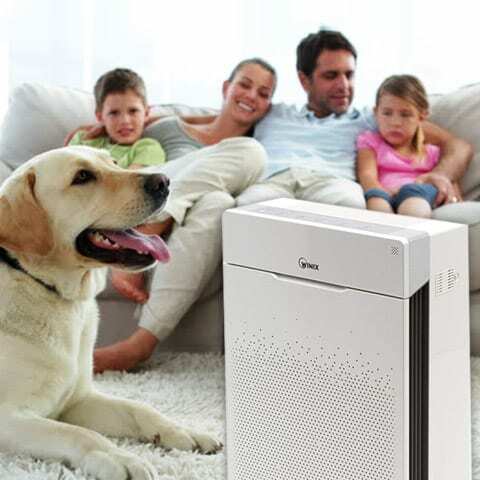 The best air purifier for pet hair only will have a “HEPA-type filter”. While there’s a subtle difference in the name, a HEPA-type filter is only capable of trapping particles in the range of 2-4 microns in size. However, this is plenty good enough to capture pet hair and fur. If you want an excellent air purifier for dog and cat hair that doesn’t cost too much, this really is your best choice. Take a look below for our top recommended air purifier for pet hair. There’s only one thing you need to keep in mind when you want to get rid of pet odors using an air purifier. And that is to make sure it comes with an “Activated Carbon filter”. Activated Carbon filters are the only type of air filters that can absorb smells produced by pets. HEPA filters of any kind just don’t have that capability. So, be on the lookout for this feature when comparing pet air purifiers. Each product mentioned below includes this special deodorizing filter. You’ve reached the point in our guide where you’ll discover what the top air purifier for pets is for dander, hair and odors. There are literally hundreds of air purifiers on the market today, but these are the absolute best ones you’ll find for pets. Hands down, this is the best air purifier for anyone who suffers from pet allergies. It has been fine-tuned to work specifically for pet owners and is very affordable. Like the name implies, this product offers several powerful features that make it a great investment for any home and is superb at trapping pet dander. The True HEPA filter traps the tiniest flecks of dander in order to reduce allergies and the Activated Carbon filter is what works solely to remove pet smells from your home. The PlasmaWave technology feature is another great bonus because it helps to kill airborne germs, bacteria and viruses that could infect your pets – no other pet air cleaner on the market includes this special technology. Another reason this product is considered the best air purifier for pets is that it’s outfitted with 3 smart sensors to continually monitor the air for animal dander and odors. Once detected, it kicks the device into overdrive in order to quickly eliminate these contaminants from your home. This ultimate air cleaner also provides the convenience of a remote control, which lets you operate it from anywhere in the room. And, with an Energy Star certification, this device costs pennies to operate. All in all, you won’t find a better air purifier for pets anywhere. If pet dander is not your concern, but pet hair is, then this device is perfect for you. While inexpensive, it still outshines a lot of other competing products because of its amazing ability to collect dog hair, cat hair, and other pet fur. This air purifier features a permanent HEPA-type filter, which is ideal for pet hair, and it can easily be cleaned with a vacuum. This means you never have to pay for a replacement. Just clean up the hair and pop it back in. Another nice perk is that it includes a set of Activated Carbon filters that focus on eliminating pet odors. For a fresher smelling home, this is an essential component. Another advantage to this air cleaner is that it’s very compact. This design allows it to stand horizontal or vertical, and be placed anywhere like the top of a table, on the floor, next to a couch, etc. Its small size also makes it easy for you to transport it to other rooms for maximum effect. If pet hair and odors are your main concern, you’ll definitely want to give this air purifier a try. While our first two recommendations are made specifically for pet owner concerns, you may find that you want a more versatile air purifier that can help with other contaminants too. If that’s the case, then this product is worth considering because it’s not much more expensive than the Hamilton Beach product. We didn’t cover the topic of UV-C lighting in our introduction, but all you need to know is that it’s a special technology that kills mold, fungi, bacteria, and viruses such as influenza (flu), staph and rhinovirus (common cold). If you want a sterile environment that’s free of germs, while also keeping pet dander and odor under control, this air purifier is a great pick. Another positive side effect of using an air purifier for dog hair and cat dander is that you’ll find you don’t have to clean your home as often. The products we recommend above are excellent at removing animal fur and allergens, but they’re also great at collecting dust and dirt particles as well. 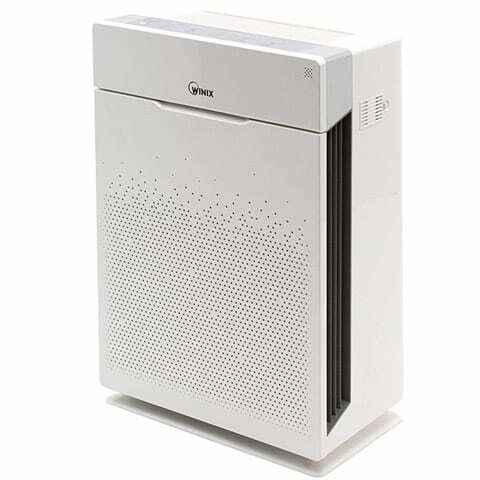 The more your air purifier is allowed to run, the more dust, debris, dander, and hair will be sucked into the machine. The more your air purifier collects those things, the less you have to clean. Homes that have an air purifier don’t look as dusty or dirty because the particles that create those messes exist less. As we all know, pets can produce a variety of odors. This is especially true for animals like cats, which are allowed to roam freely outside but live predominantly indoors. Dogs are also notorious for bringing in smells from outdoor environments after taking them for a walk or to use the potty. Indoor only pets like birds, hamsters, gerbils, potbelly pigs, ferrets, and cats also tend to have smelly cages and litter pans. Regular and thorough cleaning of these items is obviously the best way to keep odors under control, but often we don’t recognize it until an unpleasant smell has taken over the house. One of the added benefits of using the air purifiers listed above is that your home will smell fresher. As we mentioned in the product descriptions, each device includes an Activated Carbon filter that acts to neutralize pet odors, not just cover them up like aerosol sprays and scented candles do. These Activated Carbon filters are made up of millions of microscopic pores that look and operate like a sponge. As air passes through the air purifier, the molecules that are known for producing unpleasant aromas come along for the ride and get trapped inside the filter’s pores. The more air that can pass through this filter, the cleaner your home will smell. One of the biggest reasons your home smells like your animals is that the odor particles that have been tracked inside or come from the cage or litter pan have fallen onto the floor or your furniture. As traffic moves around indoors, these odor molecules get kicked back up into the air again and cause the scent to radiate. Sometimes the odor issue has gone on for so long in certain areas of the home that they are highly dense with these particles and an eminent aroma continues to exist. In order to get rid of these lingering smells, a deep cleaning may be necessary, and then the air purifier can keep work to keep those rooms smelling fresh. PlamsaWave – This is a special air purifying technology that is patented by Winix air purifiers. It is a safe form of ionization that doesn’t produce harmful ozone which is great news for you and your pets. The way PlasmaWave works is by using electrical pulses to create positive and negative ions inside the unit. After room air passes through the filters, the air is put into a plasma state. Once water vapor comes into contact with this plasma air, it forms hydroxyl radicals that then attack airborne pollutants like viruses, bacteria, and gaseous chemicals. After the hydroxyl radicals do their job, the reform back into harmless water vapor. Smart Sensors – Pet air purifiers that use smart sensors automatically monitor the air for certain types contaminants like pet dander, odor, and hair, If a high level of particulates is sensed, the air purifier will adjust itself in order to quickly eliminate the pollutants from the room. Once the particles are gone, the air purifier will go back to the mode it previously was in. This is a great feature to have, especially if you have an indoor/outdoor cat or dog that could be bringing in outside contaminants. UV-C Light – This light is a sub-band of ultraviolet radiation that’s capable of destroying microorganisms but is completely safe for humans and pets to be around. It’s in the same part of the electromagnetic spectrum that includes light, radio waves, and x-rays. Pet air purifiers that use this feature contain the UV-C light inside the unit and only expose air to it after it has passed through the filters. You can’t see the UV-C light or touch it, but it’s constantly working to sterilize the air inside the room from harmful bacteria, viruses, and germs. Anti-bacterial Coating – Some air purifiers for pets include a special coating on their internal filters that prevent the growth of bacteria, mold, and fungi. As air passes through the filters, those types of particles are trapped inside and could start to multiply on the filter. An anti-bacterial coating stops this process from occurring and helps to extend the life of the filter. Buying an air purifier is a great first step to reducing pet dander, pet hair, and odors, as well as getting relief for your cat and dog allergies. To make sure you get the most value out of your purchase, there are a few simple tips you can follow after unboxing your new air purifier for pets. You may be tempted to stick your air purifier in a corner of the room to keep it out the way but doing so will cause it to be less efficient. In fact, most air purifiers require at least 18-24 inches of clearance on all sides so they can maximize their air cleaning power. When you’re using an air purifier to get rid of pet hair, dander, and odors, it’s best to place it closer to the center of the room or at the very least where your cats or dogs like to hang out. That way the machine can filter the most number of particles from the air before they have a chance to scatter to other areas of the room or your home. Similar to our last point, you never want to block or obstruct the outward path of clean air flow. Doing so can cause the fresh air to constantly recycle on itself and never have a chance to dissipate out into the room where you need it. To make sure this doesn’t happen to you, never put your air purifier under a table if the clean air flow comes out of the top of the unit. If the air comes out of the front or sides of the air purifier, then don’t block those pathways respectably. 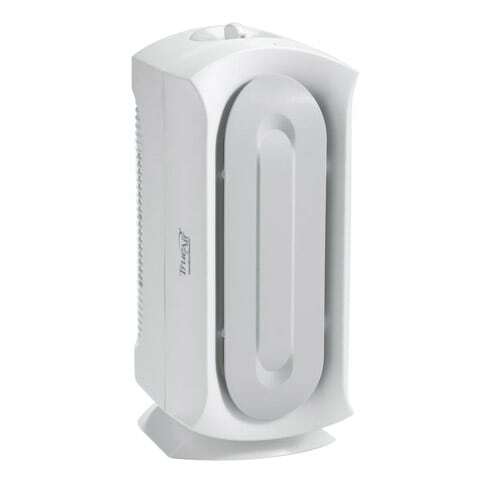 You may think to use an air purifier like a cooling fan by turning on and off as you need it. However, that is the worst thing you can do with a pet air purifier. For a machine like to this operate at peak performance it needs to run 24 hours, 7 days per week. When you turn the device on for the first time, it will work hard to remove all of the airborne contaminants that have built up inside the room. Once they’re gone, it can go into a maintenance mode to keep the air always fresh. If you turn the machine off for any length of time, you’re basically allowing contaminants to build back up again which defeats the purpose of having an air purifier to begin with. If you’re concerned about the cost of running your air purifier on a continuous basis, don’t be. Most products are very energy efficient and don’t cost more than a house fan to operate. Another tip for getting the most out of air purifiers for pets is to enclose the machine inside a tightly closed room if you can. By closing doors and keeping windows shut, you’re able to give the air purifier a chance to exchange the air inside the room over and over again until it becomes contaminant-free. The more time the machine has to operate in this manner, the fresher the air becomes. If you leave a door or window open, you’re inviting your purified air to escape and let outside pollutants to flow in. 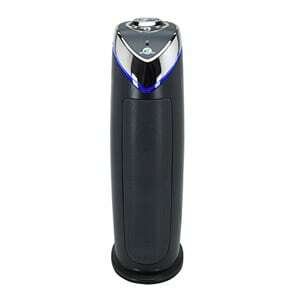 This makes the device less effective at removing the things you care about: pet dander, pet hair, and pet odors. An air purifier is only as good as the filters it has inside it. If the air filters are clogged and dirty, it can’t operate effectively. Therefore, make sure you check and change your filters on a regular schedule. Some air purifiers for pets have a filter change light that indicates to you when it’s time to perform this service. Others require a manual check. Either way, the manufacturer will outline a schedule to follow which can be found in your user’s manual. As you now know, an air purifier is one of the best investments you can make as a pet owner. Not only does it help reduce pet allergies, dander, hair, and odors, but it also creates an overall better home environment. Hopefully, this information has helped you understand more clearly why an air purifier is a great investment if you own pets, as well as guide you on making the right decision on which product to choose. The best air purifier for pets listed above are your top options as an animal owner and should serve you well for a lifetime of use.